A leading publishing source has stated that the new Wii U console will "definitely be less than £249" at it's launch. If this statement turns out to be correct, then the console could well be this Christmas' must have present which would be most welcome news for retailers with the current depressed state of the video gaming market. No official pricing has yet been announced, but UK retailers are hopeful that Nintendo have learned from its 3DS mistake whereby discounting was led by the retailers themselves. 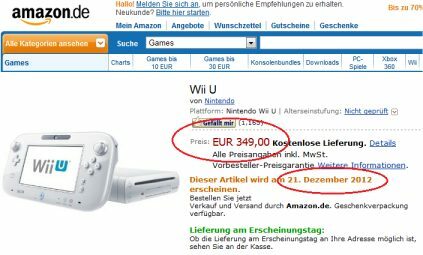 Meanwhile, the Amazon Germany website currently lists the Wii U at €349 (£275) with a release date of 21st December 2012. This however should be taken with a pinch of salt as a release date that close to Christmas just doesn't make sense as it would give Nintendo very little time to make any meaningful sales. In the UK, ShopTo.net are currently taking preorders at £279.85 with the price obviously subject to change.